Cathy Talley, A native to Tidewater, has over 20 years of experience in liquidation of quality items. For those left to handle an estate, it can be difficult to know what to do and where to turn in this process. For those downsizing, we know it often is difficult to part with collections of a lifetime. At Estate Sales of Virginia we have helped guide many people through through this process. We always handle your things with the dignity and care they deserve. We organize, research, price and display all the while keeping in mind the importance of "staging" to market items.. We believe there is only one chance to make a good first impression. We want to make that impression with each item so that it will sell at top dollar bringing the most profit for our clients. Our success is satisfied clients - clients that have provided reviews that give our future clients the benefit of their experience with ESV. If you or someone you know needs advice, assistance, or is experiencing the emotionally draining task of liquidating an estate, give us a call. Our consultations are confidential and free. CHRISTMAS EXTRAVAGANZA and BIGGEST SALE OF THE YEAR!! Step Back in Time ~ It's 1960 all over again! This company has posted a total of 30 estate sales. Only the most recent 29 sales are shown. Cathy and her crew did a fantastic job with the estate sale of my Mom's home. It was such a difficult time in my life after Mom passed. I could not have been able to sell her things or know what to do, how to give her belongings to charities, or even where to start. To have professionals come in and organize, stage, and handle the whole affair for me was a Godsend. 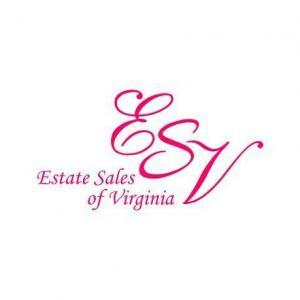 Estates Sales of Virginia is a well organized company, with a very efficient and caring staff.. Thank you Cathy for all your hard work and for doing a wonderful job during a very difficult time in my life. After I lost my wife, I rattled around in the house we shared for awhile. It was a difficult decision to make, but I realized the memories were just to much to stay. I put my house on the market and then realized I had to make decisions about all of the furniture and collections we had accumulated over the years. . My Realtor recommended I call Estate Sales of Virginia. I met with Cathy and the rest is history. She handled the entire thing from start to finish. I have the utmost respect for her and her abilities. To handle a huge estate like mine without a hitch, was a quite an accomplishment. I highly recommend her and Estate Sales of Virginia. Living out of state as an only child, I was in a quandary how I would be able to take care everything necesary in regards to my Mother's estate. After contacting Cathy, I immediately felt at ease that she was not only willing but very capable of handling everything in my absence. I met with her once, signed the paperwork and she handled everything else from that point on. I had missed quite a bit of work during my mother's illness and subsequent death. Cathy handling this for me allowed me to get back to work as an additional trip to VB was not necessary. I cannot thank her enough for her kindness, understanding (tears flowed on several occasions) and professionalism. I recommend her to anyone needing this type of service. I contacted Cathy requesting help with my Aunt's estate. She had no children, and her will stipulated all proceeds of her estate to go to the SPCA. I had no idea how to handle this. She came in, handled everything from start to finish. After depositing the proceeds into the Estate account, I was able to satisfy her request to make a donation to the SPCA. I give cudos to Cathy for her professionalism, organization and efficiency. She is top notch in my book! I can't thank Cathy enough for her kindness and professionalism in helping me sell the things I no longer needed. When I moved into a retirement community, I just didn't know what to do with the things that would no longer fit in my new home. Estate Sales of Virginia was recommended to me by a friend and I am so glad they did. They jumped right in and handled the whole thing. From setting everything up to pricing, to the sale itself. They are worth their weight in gold! I highly recommend them to anyone looking to sell items that you no longer need. Give them a call. You WILL be glad you did! It is obvious when working with her Cathy is a caring professional who does the job right! The room arrangements/staging were beautiful and effective. We appreciated her kindness and sensitivity during a difficult time.